– Draw a curved shape above the head. 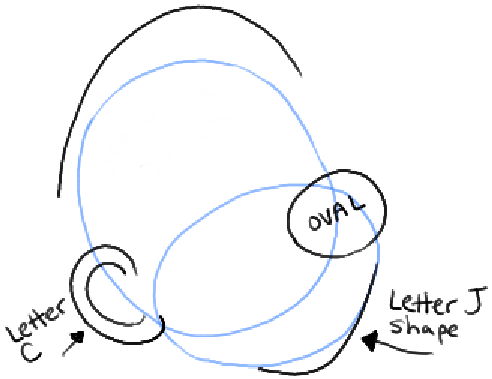 – Draw 2 letter ‘c’ shapes for the ear. – Draw an oval for the nose. 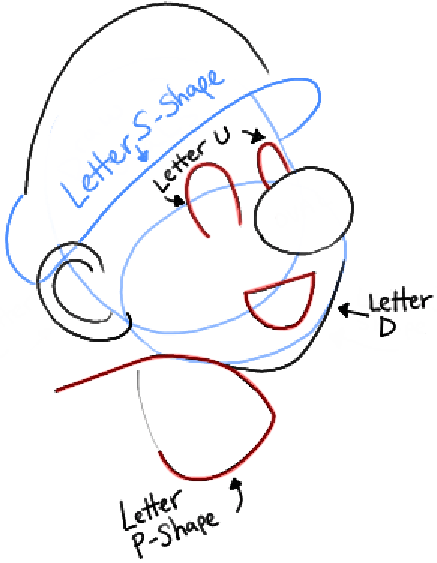 – Draw a letter ‘J’ like shape for the right side of the face. – Draw a sideways letter ‘s’ shape for the brim of the hat. – Draw a sideways letter ‘P’-like shape for the left shoulder. – Draw a sideways capital letter ‘D’ for the mouth. – Draw 2 upside down letter ‘U’ shapes for the eyes. 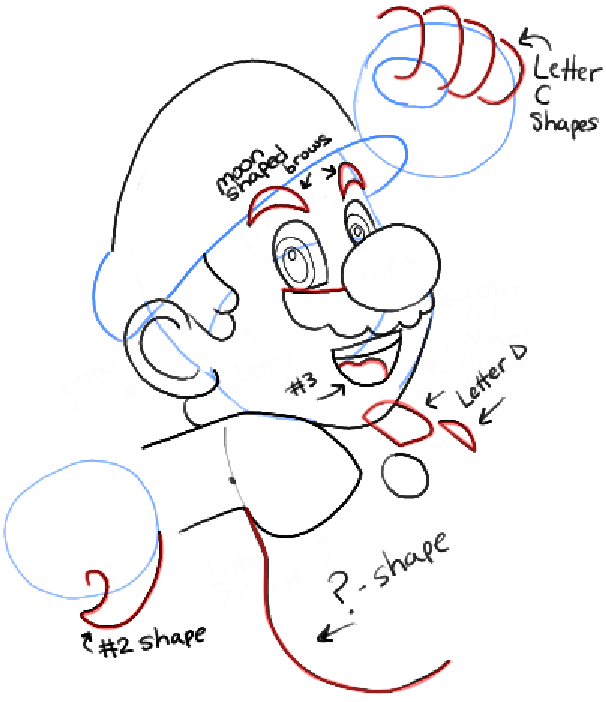 – Draw letter ‘w’ shaped humps for the mustache. Draw a letter ‘w’ shaped sideburn. 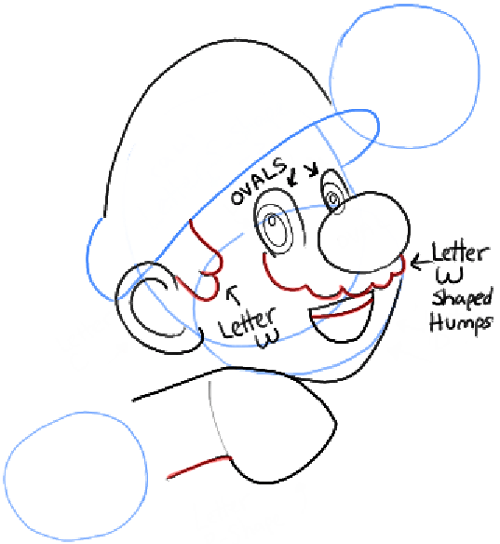 – Draw ovals inside the eyes. – Draw a curved line for teeth. 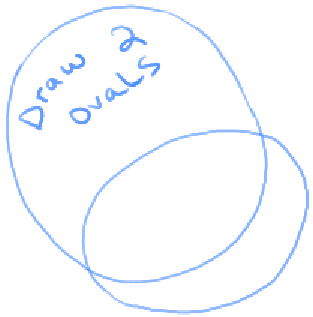 – One the left hand: Draw a #2-like shape. 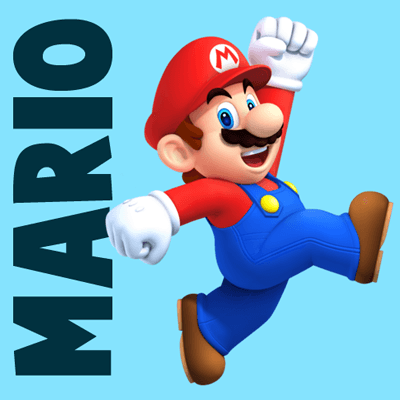 – One the right hand: Draw letter ‘c’ shaped fingers and an oval thumb. – Draw an upside down ?-like shape for the left side of the body. – Draw moon shaped eye brows. – Draw the top of the mustache and a#3 shaped tongue. – Draw 2 letter ‘D’ shapes. – Draw a sideways capital letter ‘P’ on the right hand. – Draw letter ‘L’ shapes on the left hand. – Draw a capital letter ‘D’ shape for the leg that is going to stick out. 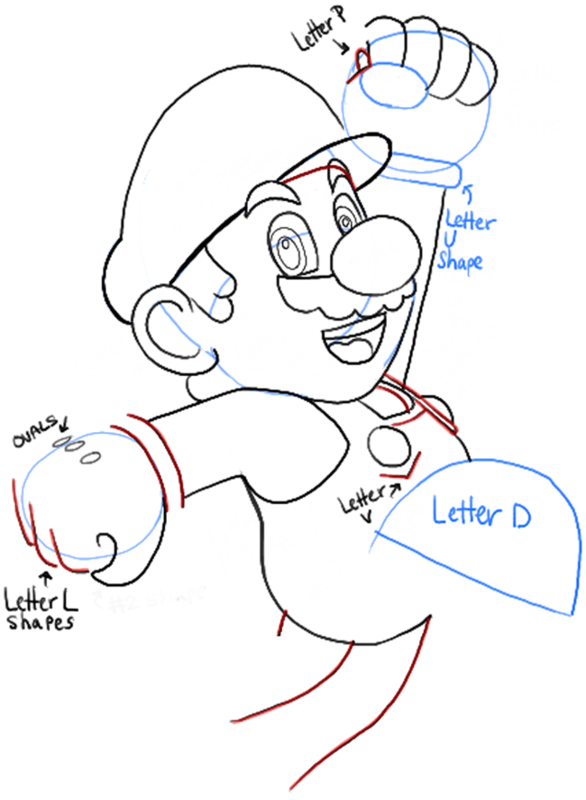 – Draw a few more basic shapes as highlighted above. 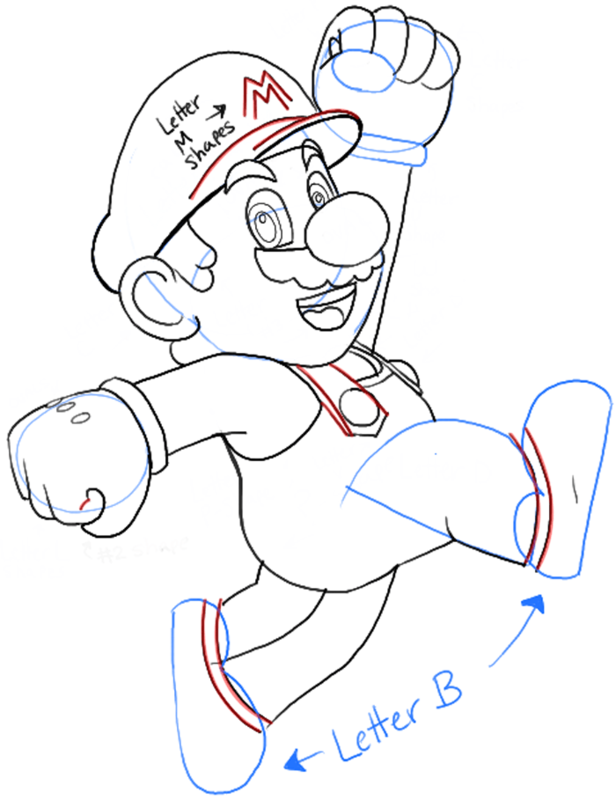 – Draw 2 letter ‘M’ shapes in the hat. 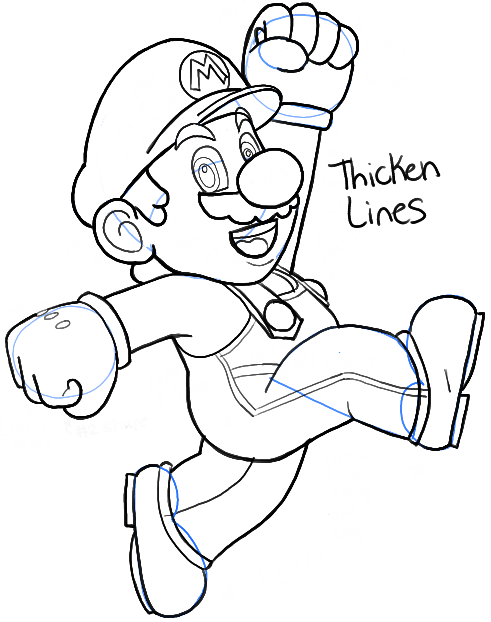 – Draw a few curved lines in the hat. 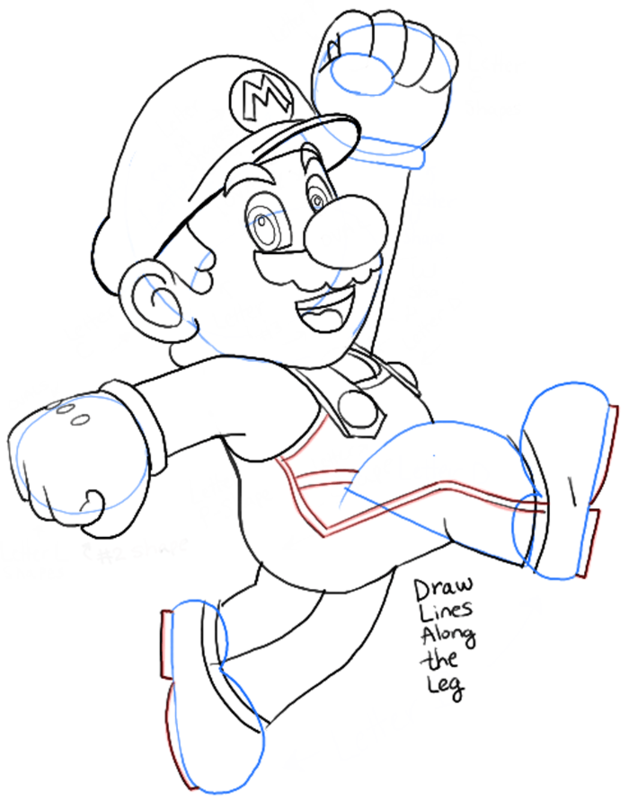 – Draw curved lines for the cuffs. – Draw letter ‘B’ shaped shoes. – Draw more basic shapes as highlighted above. – Draw some lines for the pattern in the jeans. – Draw a rectangle and curved line at the bottoms of the shoes. Erase the guidelines. 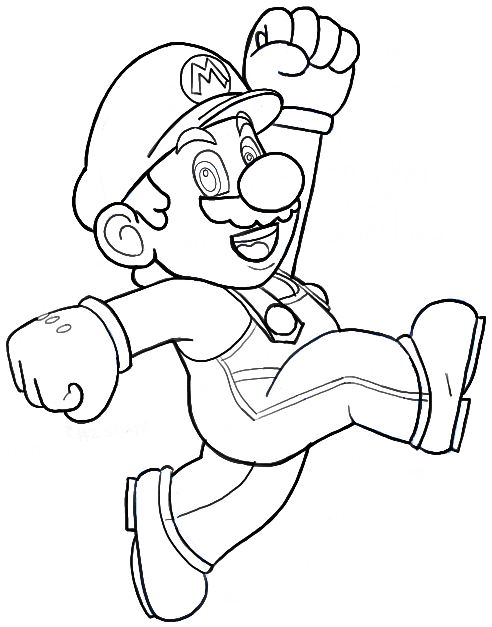 You now have a great picture of Mario that you can color in with markers, watercolors, crayons, or pastels.